Life in Penicuik took on an international feel recently for a celebration of Zambia, and in particular Zambian food. Stephan Wood, head chef at Haig’s Bar and Restaurant, went off the usual menu and whisked up a traditional and delicious Zambian lunch for 20 Friends of Chitambo board members. The Friends of Chitambo is a Penicuik-based charity supporting health projects in Chitambo, Zambia, which is a living memorial to Scottish explorer Dr David Livingstone. Dr Jo Vallis, Friends of Chitmabo chairman, said: “We have nothing but praise for Haig’s service and this generous gesture goes a long way to helping our work in Zambia. 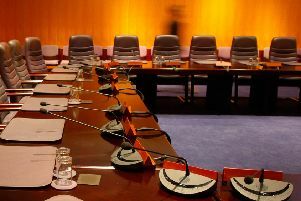 “As does the free use of their lovely function room for our committee meetings and events. This is community spirit and Scotland’s global citizenship at its very best. Among the charity’s achievements has been contributing to fundraising for an ambulance as a centenary gift for Chitambo Hospital. “This vehicle is still going strong and has saved many lives, “ Dr Vallis explained. “This is a tribute to both the Penicuik community which raised the money, and the local ambulance crews who keep the vehicle going.